Enjoy The Poconos while vacationing at ~Ski Home Vacation Rental Property! This 3-bedroom 2-bath sleeps up to 8 people. This vacation destination is located in Arrowhead Lake Community and is a short drive to the lake, heated pools, tennis, clubhouse, and area attractions! In the winter months this rental is ideal because of its close proximity to Jack Frost & Big Boulder Ski Resort! This home is warm & comfortable for a small family or couple retreat & great for any time of year! 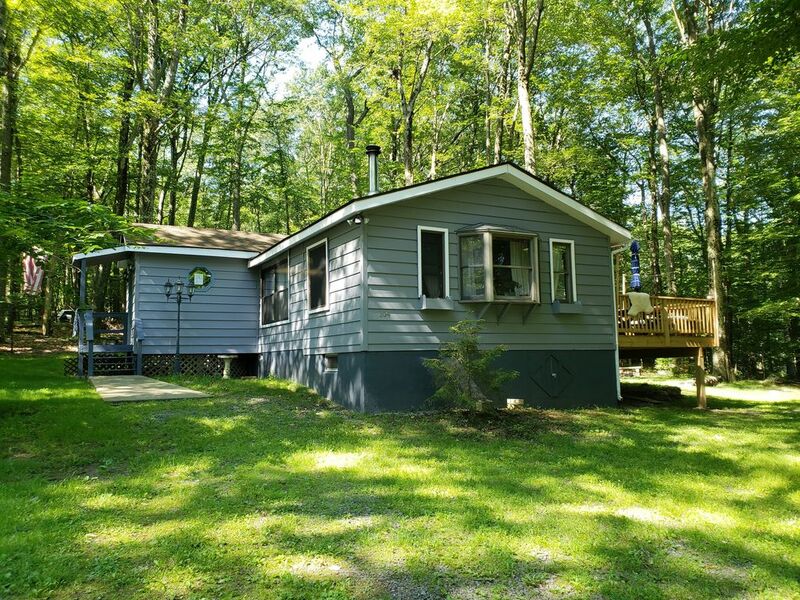 Ski Home is an all you need rental to provide a local experience in The Pocono Mountains! As you step into this single level, 960 square-foot home you notice a large open great room connected to a fully equipped kitchen! This spacious area allows for great meals and entertainment! The kitchen is connected to the great room and with a variety of appliances and fully stocked, you can show off your cooking skills to friends and family! You can prepare a delicious and memorable meal and bake an astonishing cake in our oven! Each season has a unique season in The Poconos! You will “FALL” In Love with The Poconos During September, October, and November! The unique blend of reds, yellows, and oranges make for scenic photo opportunities during this time of year. Spring – April Through June is a vibrant time of year. Make sure to bring your cameras because the area is breathtaking! Watch the foliage bloom, blossom, and come to life! Your social media following will envy your vacation pics! You may come across wildlife reemerging from the winter along with their offspring during your stay! In the summer, as you step out onto the back deck there is a grill to BBQ juicy summer burgers, hot dogs, and more summer favorites! Enjoy the relaxing summer nights with friends and family with the scenic ambiance of Ski Home. The lake and pool make summer vacations relaxing and fun and you don’t even have to leave the community! Winter time is #SkiLife this rental is close to many of the areas most popular ski resorts! Winter is cold but provides the opportunities for cuddling around the fireplace, hot chocolate, snow tubing, skiing, and snowball fights. Arrowhead Lake Community is a gold star gated community that is private and secure. Life at the lake provides access to family amenities in addition to natural and peaceful surroundings. Arrowhead Lake has 3 heated outdoor pools, sports, fitness center, fishing, boating, and more. Ski Home is conveniently located by many of our natural, local, and exciting area attractions only minutes away from this home! Some of our local attractions include golfing, skiing, waterparks, shopping outlets, dams, rivers, and hiking trails! Very spacious and open living room. Has a flat screen TV, connects with kitchen and has lots of room! We love this place and this house!very comfortable ,very clean very wArm! We enjoyed our stay very much. The house was great. The bathrooms are newly renovated and super clean. Kitchen, too. One of the showers was extra large which was great. We loved kayaking the beautiful lake and riding bikes within the Arrowhead community on roads where cars yield to pedestrians and bicycles. We also enjoyed grilling on the deck. *** ALL WEEKENDS are 2,3 OR 4 nights FOR THE SAME COST *** Cleaning Fee: $100 Arrowhead Gate pass $15 Amenity badges $35/week, $8/day for everyone over 12 during summer months Arrowhead Lakes Processing Fee: $20 Weekends - 2,3 or 4 nights SAME COST! Must be 23 years old to rent this property We accept credit cards, renter is responsible for the credit card transaction fee.